Size of Male: 40-60 lbs., 19-23 in. Size of Female: 40-60 lbs., 19-23 in. All Dalmatian dogs sport a white coat dotted by patches of liver or black. You won’t have a hard time picking them out from the crowd. No other canines can match the dogs’ close affinity with the horse and the coach. Their talent comprises a variety of fields to include the show ring, the farm, the hunting field and the carriage trail. Dalmatia is a western region in Yugoslavia after which the breed was named, but the Dalmatian’s exact origins are shrouded in mystery. Some theories suggest that this dog breed originated from a Great Dane, a Talbot hunting dog or a pointer with a dotted coat. Amidst their versatility, these dogs caught the public’s attention when they served as coach dogs during the Victorian era. They added flair to carriage processions and doubled as guard dogs. The emergence of automobiles temporarily placed them out of the limelight, but as horse-drawn fire engines became popular, the pooches were quick to reinvent themselves as modern fire dogs. The 1956 novel The Hundred and One Dalmations and 1961 Disney animated film One Hundred and One Dalmations made the sleek breed a celebrated household name. The Disney film may have upped the breed’s image, but according to experts, this dog breed sports neurotic personalities. Generally, the breed is clingy and can get pretty destructive when lonely, bored and depressed. The pooches are wary of strangers, playful with kids and hostile around other animals. Caveat: Deaf Dalmatians are snappy and are dangerous to households with kids and frail family members. 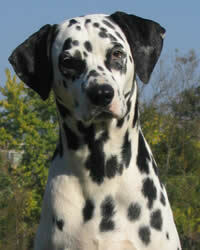 Living Environment – The Dalmatian’s endurance and stamina call for a fenced yard as an energy-venting outlet. Apartment dwelling is not recommended for this breed, although technically you can raise them in one with ample day-out activities scheduled within 24 hours. Dalmatians are not very tolerant of cool climates. Make sure your pet has a warm bed for sleeping. Grooming – Their splendidly dotted coat requires minimal care but because they shed all year, it helps to schedule regular de-shedding sessions using a stiff bristled brush. The breed is also prone to attracting fungal infections, ticks and fleas. Remember to check for these often. Baths are not scheduled frequently as shampoo could damage the coat. Diet & Exercise – Dalmatians are stone formers, thus the ideal diet is one that is low in purine protein content. This is not referring to the brand of dog food, but a type of protein with typically high concentration in internal meat organs like kidney and liver. Commercial brands are best avoided, as well as organ meats, beef, asparagus and cabbage. Canned food is generally safe, and a generous supply of fresh, drinking water is a must. Your pet can run for miles and hours tirelessly. You should be able to plan a variety of activities with extended play time for your dog. A once-a-day leashed walk isn’t always enough. Several jogs and interactive play time with the owner are strongly suggested. Health – These dotted darlings may excel in a variety of fields. Unfortunately, they do not star in the dog health department. About one-third of this dog breed population is either partially or completely deaf. The breed requires long-term monitoring, especially in the areas of urination and dieting. Reports indicate that Dalmatians with stone formation problems tend to become aggressive and unstable. Absent basic dog obedience training and intensive socialization, the Dalmatian can be an unwieldy dog breed. You may notice the pooch become either too obstinate or too timid during training sessions. It’s best to invest a lot of patience, love, firmness and positive rewards when handling the dog. These dogs are moderately trainable and do very well in agility contests, ball games and obedience competitions.